Scheduling the attack approach has been an interesting turn of events. Late Wednesday of last week, I took the wife to a fantastic Indian restaurant for a much needed adventure outside of the walls of our apartment. Working from home (or looking for work from home) has taken it’s toll and it was prime time to get the hell out and have a “date night.” We tried not to speak of the ills of work and enjoy our short lived moment, yet the toils and troubles of the modern day find ways to creep into the shadows and subtext, eventually making their way into conversation like a poison dart. The planning stages made a wedge between appetizers and the main course. Upon picking through the scattered plans of days and evenings I realized that my 4 year wedding anniversary is Thursday. Oh. Um, yes… it’s Thursday. I might want to buy flowers or something? Where has the year gone? That’s right folks, four years ago my lovely wife, Christine, and I got hitched on a late Saturday afternoon in San Francisco. 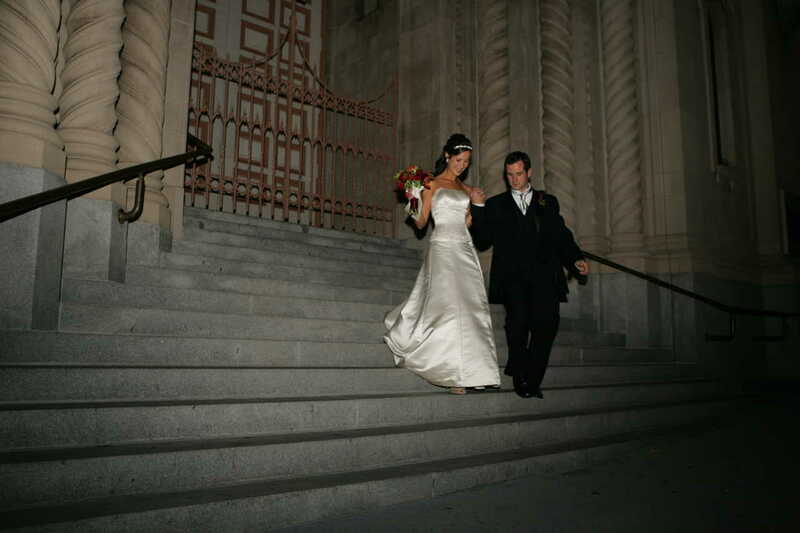 The ceremony was held a St. Peters and Paul Cathedral in Washington Square. It might have been the last time I’ve seen some of my close friends, but I’m certainly glad we got to share it with everyone that could attend. As we have changed, the city has changed… and stayed the same. We’re older (not necessarily wiser) and have learned a lot of lessons in that short amount of time. In the grand scheme of things, four years is not a long stretch… but I’m pretty proud of it so far. As much time as I have spent searching and prepping for jobs – building reels, adding things to the website, meeting strangers at parties, and making sure that I keep in contact with them afterward… I have totally lost track of where the time has gone and what direction the boat is headed. I know where I want the ship to go, but we’re currently lost at sea (or space). My youngest brother just had a birthday, the year is half gone, and if the Mayan’s have anything to do with it, next year we’re all in for the big one. I guess I’ll keep searching for inspiration and completing my own projects until then.So, my advice (if it’s any advice to take to heart) take some time to make time. Enjoy the little things. Listen to some music. Laugh with friends and take a walk outside every once in a while. Go out to lunch. Have a drink with an old friend. Write someone a letter. Take advantage of what you’ve got because the time you have today is gone tomorrow and time, my friends, is something that you can NEVER get back. You don’t misplace it… you lose it, or spend it doing things that don’t make that much of a difference anyway. Yes, mom… I’m trying to chill out a bit. Not being in the heinous throes of LA traffic today has mellowed my temper for the time being. But I swear I will not drive with a handgun, baton, or golf paraphernalia… I would have a tendency to use such devices as they were meant to be used. The age old adage that if you do what you love you’ll never work a day of your life. I’m pursuing that… but it’s getting to be a lot of work to get there. So, if you know anyone working at a Studio, send them my way. I can promise that I will rise to the occasion and not disappoint.